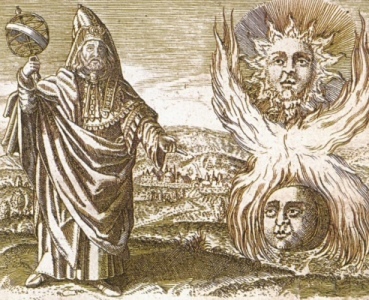 The “Vision of Hermes”, like nearly all of the Hermetic writings, is an allegorical exposition of great philosophic and mystic truths, and its hidden meaning may be comprehended only by those who have been “raised” into the presence of the True Mind. “In such wise then,” the Shepherd continued, “the generation of these Seven came to pass. Earth was as woman, her Water filled with longing; ripeness she took from Fire, spirit from Ether. Nature thus brought forth frames to suit the Form of Man. And Man from Life and Light changed into soul and mind — from Life to soul, from Light to mind. And thus continued all the sense-world pairings until the period of their end and a new beginning arrived. And after he said this, the Shepherd of Men mingled again with the Powers. A GREEK FORM OF HERMES. The candidate, in his plain white robe, gazed into the utter blackness framed by the two great Lotus-headed columns between which the veil had hung. As he watched, a luminous haze distributed itself throughout the atmosphere until the air was a mass of shining particles. The face of the neophyte was illumined by the soft glow as he scanned the shimmering cloud for some tangible object. The initiator spoke again: “This Light which ye behold is the secret luminance of the Mysteries. Whence it comes none knoweth, save the ‘Master of the Light.’ Behold Him!” Suddenly, through the gleaming mist a figure appeared, surrounded by a flickering greenish sheen. The initiator lowered his wand and, bowing his head, placed one hand edgewise against his breast in humble salutation. The neophyte stepped back in awe, partly blinded by the glory of the revealed figure. Gaining courage, the youth gazed again at the Divine One. The Form before him was considerably larger than that of a mortal man. The body seemed partly transparent so that the heart and brain could be seen pulsating and radiant. As the candidate watched, the heart changed into an ibis, and the brain into a flashing emerald. In Its hand this mysterious Being bore a winged rod, entwined with serpents. The aged initiator, raising his wand, cried out in a loud voice: “All hail Thee, Thoth Hermes, Thrice Greatest; all hail Thee, Prince of Men; all hail Thee who standeth upon the head of Typhon!” At the same instant a lurid writhing dragon appeared–a hideous monster, part serpent, part crocodile, and part hog. From its mouth and nostrils poured sheets of flame and horrible sounds echoed through the vaulted chambers. Suddenly Hermes struck the advancing reptile with the serpent-wound staff and with snarling cry the dragon fell over upon its side, while the flames about it slowly died away. Hermes placed His foot upon the skull of the vanquished Typhon. The next instant, with a blaze of unbearable glory that sent the neophyte staggering backward against a pillar, the immortal Hermes, followed by streamers of greenish mist, passed through the chamber and faded into nothingness. For all those who want to study the the sublime Occult Mysteries this book is one of the very few that reveals the TRUE LIGHT. This is not a book for those seeking “glamour”, “thrills”, “mystery” or “instant enlightenment”. Within the golden pages of the “Divine Pymander” the genuine, sincere seeker after Truth will find the answers to the great questions of life clearly and beautifully set forth. Here are true elucidations of the secrets of the Soul, Mind and body, of the beginning of Life, of the universe, and the ultimate purpose of Man and his true constitition and destiny. One could read a thousand books and not find the great truths revealed in this little volume. No sincere seeker after Truth and spititual enlightenment will be disappointed with this book. [ — Review by a Reader]. A number of other books has been written about these seven principles, using somewhat more modern language, but this book is the classic. This is not just a theory or a philosophy – the principles, being universal, are down-to-earth practical. If you apply them consciously in your life, your life will change. While in times long gone by, these may have seemed to be only arbitrary spiritual principles, they are in accord with the view of quantum physics. Kybalion states that universe is mind-like in nature; quantum physics states that the universe is composed out of intelligent energy. The rest of the book describes how to manifest anything with one’s thoughts – the process of manifestation, and it reminds me of the book “Dimensional Structure of Consciousness” by Samuel Avery. The most important part of this book – other than pointing out these principles is that they are UNIVERSAL – they always work, they express throughout nature and if you use them and apply the consciously, you can create whatever you can possibly desire in your life. You will know then that there is a law and that it works with mathematical precision, and that you can ALWAYS count on it. The moment you grasp this truth, you will never ever again wish or hope for something to happen, you will know that you have the power to create it and you will be certain of it. And when you use this principles consciously and experience the truth of them – no one in the entire world will ever be able to talk you out of fulfilling your heart’s desires. Even if the entire world doubts and laughs at you, you will not care because you’ll KNOW that you CAN. You will have the “key”. So the essential guide through out all time and space,very interesting casually mentioned how the tuned and vibrant radiance resonance equally the being of symbolic frequently vibrant radiance sphere. These others are the sources as the original message sumes they are names between and together dimensions. The mystery suggests persuits of heaven and earth can experience devine bliss or pure hellish conditions. Either way we are truelly our brothers keepers if nor then we are all dammed for eternal torment of the sins that fell from grace. The wellbeing and persuits are now magical beyond suggested. The mystery of the wellbeing and your persuits. The spiritual and religious persuits of wellbeing from heaven on earth as the mystery suggests.